When his mother lost contact with the family, Xiao Wei was only a toddler. 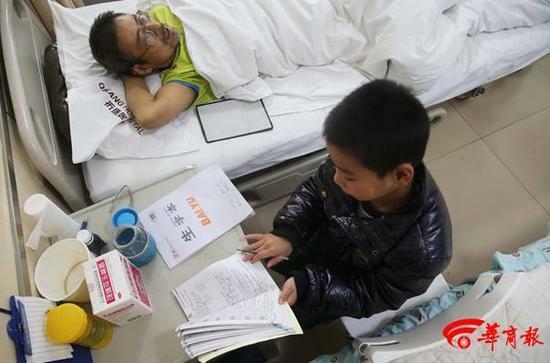 A nine-year-old boy has shown extraordinary devotion while taking care of his father hospitalized for liver cirrhosis. Nine years on, the boy, a native of Lantian in Shaanxi Province, has taken time off from school to serve at his ailing father's bedside. The father was hospitalized for liver cirrhosis in the provincial capital of Xi'an. In the past few weeks, the boy has brought food and drinks to his father, feeding and massaging him several times each day to show his love and fulfill his obligations as a son. Once when sharing rice noodles with his father, the boy said, "My father is feeble, he needs more nutrition." His filial piety has touched many in the hospital. "My son asked for leave from school to take care of me. He is so kind and considerate, which makes me feel much indebted," his father said with tears streaking down his face. Despite his eagerness for schooling, Xiao Wei still chose to stay with his father in the hospital. "I cannot leave my father alone in the hospital, because he cannot take care of himself," the boy explained. The father is at risk of variceal hemorrhage, a potentially fatal bleeding of abnormally enlarged veins in the esophagus and stomach. Because the illness is contagious, the hospital gave Xiao Wei a thorough physical exam and was relieved to find the boy already had a strong immune system. The local government of Lantian offered emergency subsidies totaling 10,000 yuan (US$1,516) to the family and hired a nursing aide to take care of Xiao Wei's father to assure that the boy can go back to school. The school has also waived all the boy's food and accommodation fees .